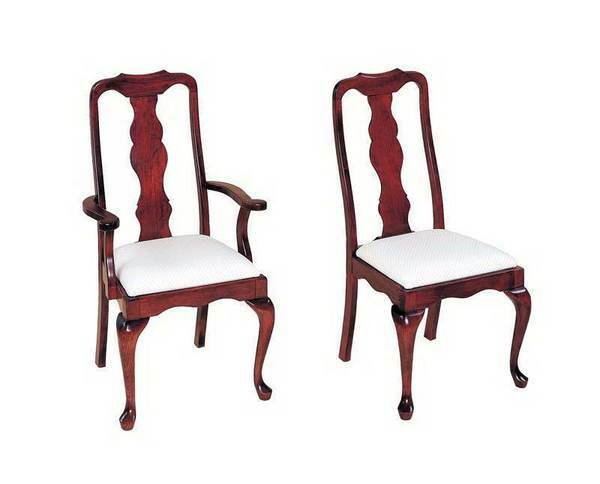 Our Keystone Queen Anne and Keystone Regal Amish furniture lines are marked by cabriole legs, fiddle-back chairs, delectable curves, and sculpted edges. Our Queen Anne and Regal Amish Furniture are stunning in dark cherry. The most elegant handcrafted furniture we offer. Our Queen Anne rendition is fluid in its formality, not fussy. The compound curve of the dining room chair back post is balanced by the front cabrioles, a harmonic carried through in the dining room table legs. Scalloped backsplats resonate with the scallops on dining room table corners and dining room chair skirts. Upholstering adds a fine finishing touch on the dining room chairs.